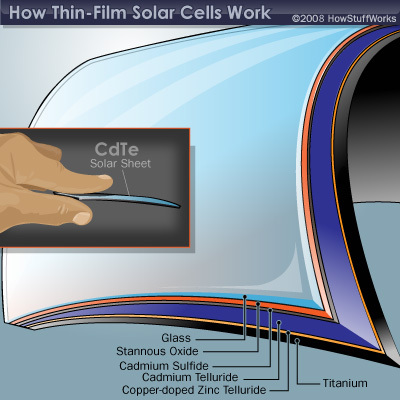 Cadmium telluride (CdTe) is a photovoltaic (PV) technology based on the use of a thin film of CdTe to absorb and convert sunlight into electricity. CdTe is growing rapidly in acceptance and now represents the second most utilized solar cell material in the world. The first is still silicon. Solar panels based on CdTe are the first and only thin film photovoltaic technology to surpass crystalline silicon PV in cheapness for a significant portion of the PV market, namely in multi-kilowatt systems. Research in Cadmium telluride dates back to the 1950's because it is almost perfectly matched to the distribution of photons in the solar spectrum in terms of optimal conversion to electricity. Early leaders in CdS/CdTe cell efficiencies were General Electric in the 1960s, and then Kodak, Monosolar, Matsushita, and AMETEK. Professor Ting L. Chu of Southern Methodist University and subsequently of University of South Florida, Tampa, made significant contributions to moving the efficiency of CdTe cells to above 15% in 1992, a critical level of success in terms of potential commercial competitiveness. This was the first thin film to reach this level, as verified at the National Renewable Energy Laboratory (NREL). Matsushita claimed an 11% module efficiency using CSS and then dropped out of the technology, perhaps due to internal corporate pressures over cadmium which is highly toxic. A similar efficiency and fate eventually occurred at BP Solar, which dropped the technology in the early 2000s. Best cell efficiency has plateaued at 16.5% since 2001 (a record held by NREL). The opportunity to increase current has been almost fully exploited, but more difficult challenges associated with junction quality, with properties of CdTe and with contacting have not been as successful. Improved doping of CdTe and increased understanding of key processing steps (e.g., cadmium chloride recrystallization and contacting) are key to improving cell efficiency. Since CdTe has the optimal band gap for single-junction devices, it may be expected that efficiencies close to exceeding 20% (such as already shown in CIS alloys) should be achievable in mass produced CdTe cells. In 2009, EMPA, the Swiss Federal Laboratories for Materials Testing and Research, demonstrated a 12.4% efficient solar cell on flexible plastic substrate. The major advantage of this technology is that the panels can manufactured at lower costs than silicon based solar panels. First Solar was the first manufacturer of Cadmium telluride panels to produced solar cells for less than $1.00 per watt. Some experts believe it will be possible to get the solar cell costs down to around $0.5 per watt. With commodity-like margins and combined with balance-of-system (BOS) costs, installed systems near $1.5/W seem achievable. With sufficient levels of sunlight – this would allow such systems to produce electricity in the $0.06 to $0.08 / kWh range – or for less than fuel based electricity costs. 1. Ease of manufacturing: The necessary electric field, which makes turning solar energy into electricity possible, stems from properties of two types of cadmium molecules, cadmium sulfide and cadmium telluride. This means a simple mixture of molecules achieves the required properties, simplifying manufacturing compared to the multi-step process of joining two different types of doped silicon in a silicon solar panel. 3. Cadmium is abundant: Cadmium is abundant, produced as a by-product of other important industrial metals such as zinc, consequently it has not had the wider price swings that have happened in the past two years with silicon prices. 1. Lower efficiency levels: Cadmium telluride solar panels currently achieve an efficiency of 10.6%, which is significantly lower than the typical efficiencies of silicon solar cells. 2. Tellurium supply: While Cadmium is relatively abundant, Tellurium is not. Tellurium (Te) is an extremely rare element (1-5 parts per billion in the Earth's crust. According to USGS, global tellurium production in 2007 was 135 metric tons. Most of it comes as a by-product of copper, with smaller byproduct amounts from lead and gold. One gigawatt (GW) of CdTe PV modules would require about 93 metric tons (at current efficiencies and thicknesses), so the availability of tellurium will eventually limited how many panels can be produced with this material. Since CdTe is now regarded as an important technology in terms of PV’s future impact on global energy and environment, the issue of tellurium availability is significant. Recently, researchers have added an unusual twist – astrophysicists identify tellurium as the most abundant element in the universe with an atomic number over 40. This surpasses, e.g., heavier materials like tin, bismuth, and lead, which are common. Researchers have shown that well-known undersea ridges (which are now being evaluated for their economic recoverability) are rich in tellurium and by themselves could supply more tellurium than we could ever use for all of our global energy. It is not yet known whether this undersea tellurium is recoverable, nor whether there is much more tellurium elsewhere that can be recovered. However, as I was doing research for this article I found more than one article (in mining publications) that suggested that the capacity for manufacturing thin-film photovoltaic solar cells from cadmium telluride is very close to the maximum supply of tellurium available, or that may become available and that the ability of companies like First Solar to continue to expand at the rates they have been growing at over the past several years will become increasingly difficult to maintain because of lack of available tellurium (even with recovery from recyclying). Cadmium is one of the top 6 deadliest and toxic materials known. However, CdTe appears to be less toxic than elemental cadmium, at least in terms of acute exposure. This is not to say it is harmless. Cadmium telluride is toxic if ingested, if its dust is inhaled, or if it is handled improperly (i.e. without appropriate gloves and other safety precautions). The toxicity is not solely due to the cadmium content. One study found that the highly reactive surface of cadmium telluride quantum dots triggers extensive reactive oxygen damage to the cell membrane, mitochondria, and cell nucleus. In addition, the cadmium telluride films are typically recrystallized in a toxic compound of cadmium chloride. The disposal and long term safety of cadmium telluride is a known issue in the large-scale commercialization of cadmium telluride solar panels. Serious efforts have been made to understand and overcome these issues. Researchers from the U.S. Department of Energy's Brookhaven National Laboratory have found that large-scale use of CdTe PV modules does not present any risks to health and the environment, and recycling the modules at the end of their useful life resolves any environmental concerns. During their operation, these modules do not produce any pollutants, and furthermore, by displacing fossil fuels, they offer great environmental benefits. CdTe PV modules appear to be more environmentally friendly than all other current uses of Cd. The approach to CdTe safety in the European Union and China is however, much more cautious: cadmium and cadmium compounds are considered as toxic carcinogens in EU whereas China regulations allow Cd products for export only. The issue about regulating the use of Cadmium Telluride is currently being discussed in Europe. At the present time – the most common opinion is that the use of Cadmium Terlluride in residential / industrial rooftop installations does not pose a major environmental problem. However, some groups have expressed concern about large utility sized projects in the desert and the possibility of release of cadium gases or water table contamination. Click here to read more about this subject. 1. Boosting efficiencies by, among other things, exploring innovative transparent conducting oxides that allow more light into the cell to be absorbed and that collect more efficiently the electrical current generated by the cell. 2. Studying mechanisms such as grain boundaries that can limit the voltage of the cell. 3. Understanding the degradation that some CdTe devices exhibit at contacts and then redesigning devices to minimize this phenomenon. 4. Designing module packages that minimize any outdoor exposure to moisture. 5. Engaging aggressively in both indoor and outdoor cell and module stress testing. For example, we propose to test thin-film modules in hot and humid climates. Click on the appropriate link to return to the top of this page about Cadmium Telluride technology or to return to the previous section about Thin Film Technologies.